The controversial primary school league tables for England, based on children's Sats results, have been published. They show how 10 and 11-year-olds did in English, maths and science tests. Out of more than 13,000 schools, in only 268 were all the pupils working at the expected level in all three subjects - down from 329 last year. And in 884, more than half the pupils moved up to secondary school without the required level of maths and English - up from 798. One of the government targets is to increase the proportion achieving the expected level - national curriculum Level 4 - in both English and maths to 78% by 2011. The tables show that in 2009 it was 72% per cent, a decrease of one percentage point from last year. The school which had the highest average point score per pupil - 32.9 - is Hampstead Norreys Church of England Primary School in West Berkshire. The worst published results were at one of the two dozen or so academies which cater for primary age children, the Steiner Academy in Hereford, where none of the pupils obtained the level expected for their age. The academy - operating on Steiner Waldorf learning principles - teaches its own curriculum but, being state funded, was required to enter children for the Sats. Parents had a different idea, according to the principal, Trevor Mepham. "The parents were involved in a campaign against the children sitting the tests," he said. "We registered the children and the parents in large numbers decided that they would not have their children sit the tests." The Department for Children, Schools and Families said that in science, all pupils were working below the level of the test so were not required to sit it. In English and maths, five were in the same position - and the other 19 were absent on the test dates. The turn of events is an embarrassment for ministers who promote Academies as the answer to under-performance in England's schools. The Conservatives, too, are keen to see more Academies and to have more parents' groups setting up schools and controlling their destinies. The next worst performing school was St Mary's CofE (VA) Primary School in Worcestershire, with a combined score of 50 out of 300. There, only 7% managed the expected level in both English and maths. The school recording the greatest pupil improvement - in the form of the contextual value added score - was Blue Bell Hill Primary and Nursery School in Nottingham. It had 105 on the measure, which is based around 100, which takes in to account pupils' backgrounds not just their raw results. Schools Minister Diana Johnson said schools had made huge progress over the past 12 years - but the figures confirmed "a small dip" in English performance this year. "We want as many children as possible to leave school with the secure grasp of the basics and after years of the necessary top down approach, it's now down to local authorities to get all schools making progress all of the time - no ifs or buts," she said. Head teachers' leaders say they are determined that this will be the last time that the system is used unfairly to compare schools in vastly different contexts. 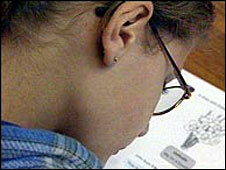 "League tables of pupil performance are misleading to parents," said the National Association of Head Teachers. "They are also demoralising for schools and school leaders, particularly those working tirelessly in tough communities, and they add nothing to the impetus for school improvement." Within the UK the league tables are a uniquely English phenomenon. The general secretary of the National Union of Teachers, Christine Blower, said: "Every year teachers ask themselves why their schools have to go through this charade." She acknowledged that Schools Secretary Ed Balls was proposing a new school report card, summarising schools' performances on a wider range of measures. "I am afraid that too is doomed to failure with the government, and indeed the Conservatives, determined to continue with the principle that test results describe a school's success or failure," Ms Blower said.